Many of us who live in places where products for naturally curly hair aren’t easily accessible learn to make due with the few resources we have at our disposal. But every so often we, or at least I, decide to bite the bullet and place that rather pricy online order to have a product that we’ve been lusting over shipped across the waters. My first such purchase was for the Mixed Chicks leave-in conditioner, which I had been reading about for absolute ages. I was desperate for a lightweight leave-in and decided to give this product a go. I bought the conditioner in August last year on amazon.co.uk and luckily a friend who came to visit from England was able to bring it over for me. My hair loved the product from the moment I applied it. It really is as lightweight as it claims to be. It absorbed into my hair easily. It helped with the detangling process. My curls were really soft and moisturised for days afterwards. It didn’t weigh down my curls at all. It has a subtle floral aroma. All in all, my hair really loves this product, and because it’s so lightweight, it leaves my curls soft and bouncy. I cleansed and deep conditioned my hair as I usually do, and only applied a small amount of leave-in to each section. I sealed with coconut oil before I put my hair into chunky twists to air-dry over night. And voila! I can definitely see this product becoming a staple during the hot and sweltering Tokyo summer. Hi Portia, thanks so much for reading. I know what you mean though. These costs can really skyrocket, so I have to say I budget quite carefully and even save up to purchase some of these products. Hopefully now that natural hair care is gaining momentum in SA, more of these types of products will become available and at reasonable price. 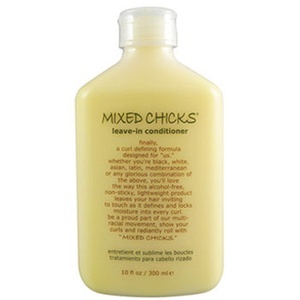 At the moment I only know of one SA stockist of Mixed Chicks leave-in conditioner, and that’s http://theperfecthair.co.za/ Give them a try. Again, it’s quite pricy, but a little does go a long way, so I think it’s worth a try.